Peggy Petite made her debut in 1953 as a one piece stuffed vinyl bodies with separate heads. Adorable funny butts. Are stamped Horsman on head, and a numbers like 14. She was 13" - 14" high that year, but in subsequent years, she became even smaller. After 1955 , I don't think they made the larger sizes of her. Horsman then produced only the 8" Peggy Petite size. When Peggy Petite went down to the 8" size, her head was redesigned and she isn't so much "Ruthie-like" then. They did some really cute things with the tiny Peggy Petite, though. Peggy Petite in all sizes was a real clothes horse. 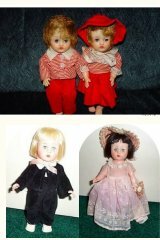 Cute variations of 8" Peggy Petite. This is the classic Ruthie head on a 15"-16" Magic Skin body. She came in a whole variety of hair colors and many outfits, but only one size. She was a toddler style doll even though her name implies she is a "baby". This is my favorite Ruthie type of all. 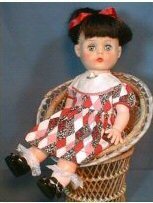 In 1959, Horsman took this dolly's face and launched a new line of moveable vinyl dolls - for which they resurrected their name from an earlier era - and christened her Ruthie. To begin Ruthie's earliest incarnation in molded vinyl, continue with Heavy Vinyl I Ruthies. Love Me Baby magic skin dolls. 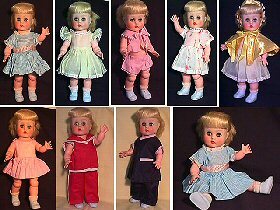 The one in blue dress above in all original includint the VHTF adorable rubber shoes with molded flowers on them.